Classic and traditional, the Home Styles Americana Headboard is a carved oaken headboard that features a beautifully shaped design to deliver timeless charm to your space. Its aged, worn look gives you some vintage flair and is versatile enough to be paired with any kind of bed and décor. Enclosed back panel with convenient cord access. The Sauder Orchard Hills Bookcase Headboard is an oaken headboard that features plenty of cubbies for you to store your bedside essentials. It features two adjustable shelves as well as an enclosed back panel, which has convenient cord access. The headboard has been finished in Carolina Oak. The Sauder Shoal Creek Oiled Oak Headboard gives you not only a handsome oaken headboard but one that has plenty of storage as well. It is easily able to attach to any queen- or full-sized bed and comes with cubbies and storage drawers for smaller items. Requires partial assembly by 2 adults (tools not included). 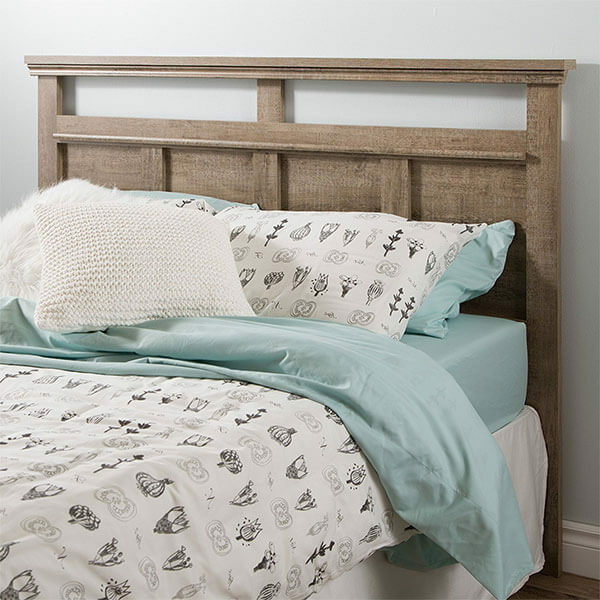 Get the beachy, coastal look that you love in your bedroom with the South Shore Versa Headboard. The South Shore Versa Headboard features vertical laths that offer a nice bit of texture and is complete with two cut-out spaces that offer it a more traditional look. It can fit onto any queen- or full-sized bed. The Sauder Dakota Pass Panel Headboard is a traditional-looking bed frame that can add classic charm to your bedroom. It features framed edging and inset paneling to offer it a bit of detail and depth. 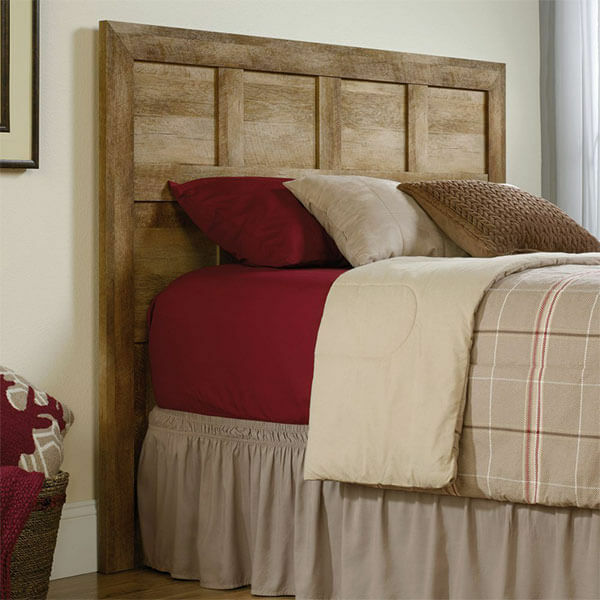 Finishing off this headboard is the Craftsman oak finish for a rustic touch. 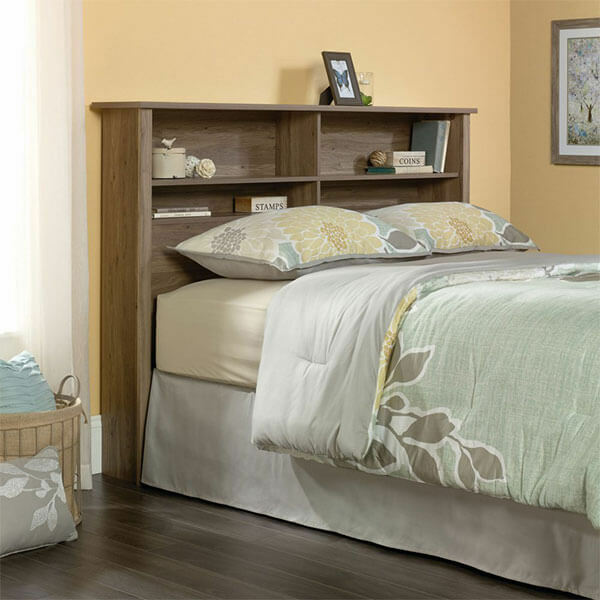 Combine form and function in this Sauder Bookcase Headboard. This headboard features ample room for storing your bedside necessities or for adding some décor. It has an enclosed back panel that offers room for your cords to be passed through in order to give you convenient access for alarm clocks and cell phones.